LibrarySparks Magazine (Aug/Sept 2006) Reader's Theater script developed by Toni Buzzeo for Axle Annie and the Speed Grump. Also an author interview (that's me). Sorry to be a little late adding this to the site! A big concern for school bus drivers is other drivers who don't obey the safety rules. 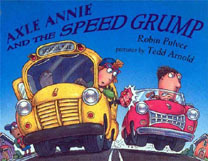 When I was writing about Axle Annie's trouble with speed grump, Rush Hotfoot, I got a lot of good advice from school bus safety experts. I also visited the transportation building at my local school district (Pittsford, NY), where I was allowed to sit in the driver's seat of a big yellow bus. I learned how to operate the safety lights and the swing-out, stop-sign arm. When my children were growing up, I always had great respect for school bus drivers and gratitude for the care and humor they bring to the job.